Platform tuning has never been so effective, with EmailSuccess you can optimize delivery by tuning email delivery parameters automatically, in real-time. 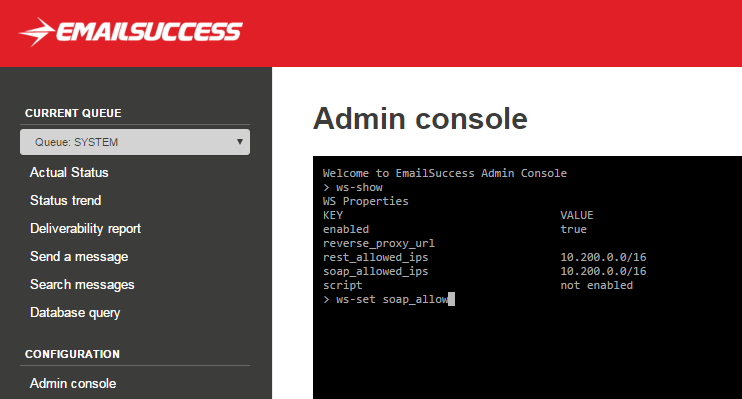 EmailSuccess is a powerfull SMTP server designed to manage high speeds and high volumes. Sending Latency, Reliability, Scalability and Deliverability are fundamental metrics to be reach in a high-performance sender infrastructure. EmailSuccess provides a detailed built-in classification and categorization system that allows you to clearly analyze all types of bounces and feedback loops. Track each type in real time and improve your performances. Feedback Loop (FBL) handling: Collect spam complaints sent by ISP and forward them to any other system. Seamless Integration with your existing applications, with EmailSuccess you can immediately start sending through the SMTP interface or you can integrate your own systems using the APis. EmailSuccess is designed to meet the toughest Enterprise requirments, with the built-in VirtualMTA technology you have full control over Security, Accountability, IPs and traffic segmentation for specific email flows. EmailSuccess can generate automatic and real-time data feeds to support your analysis systems; event notifications can be easily pushed back to your own applications. HTTP notifications: Ask the system to send back an HTTP notification every time a message is sent or has received a temporary error to automatically feed your system with all the sending information that you need to monitor the status of the sendings.